I made my second balloon skirt. I really love the first one, but my size has changed since and it doesn't sit well on my waist any more. I still keep it because I love it too much, but I decided to make another and here we see a brand new spring balloon skirt. 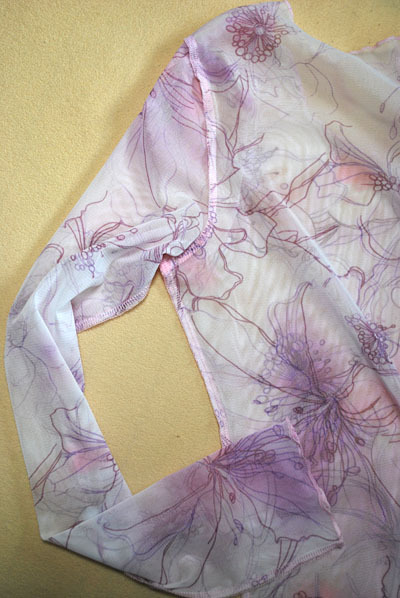 The color of this silk chiffon is very difficult to describe. The base color is pale opaque gray, somewhat pink. It is also very sheer, because of the thinness. 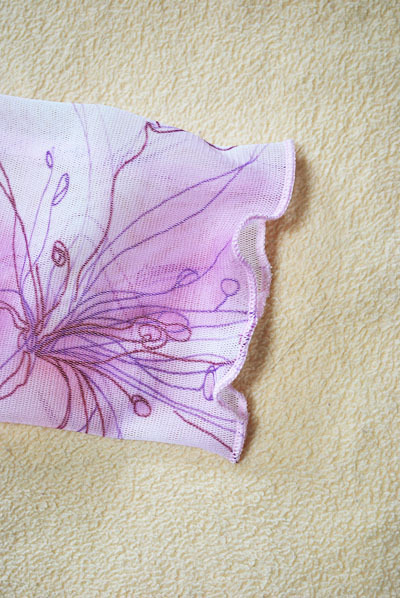 Flowers are pale blue and white pink and giving some colors onto the fabric. I was going to sew a very feminine long dress when I purchased this fabric, but I changed my mind. I think I did quite right! 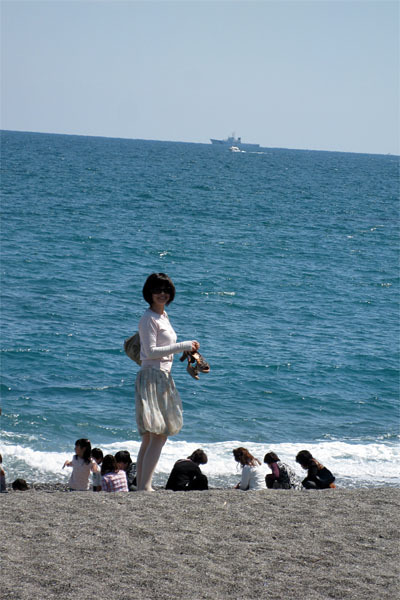 The photographs were taken at a seashore last week. 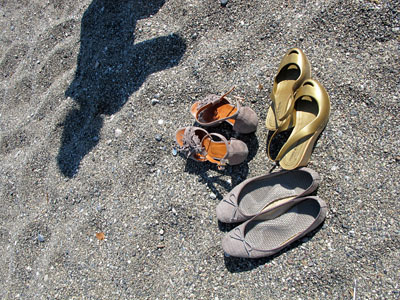 I took some days off for a short holiday with Miho and Chigu, staying an island. 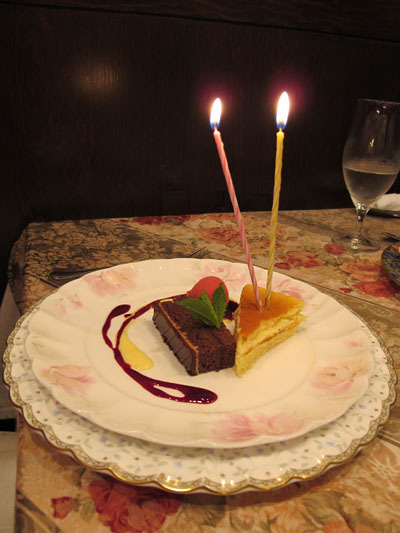 I knew it was my birthday, and I did expect a chorus of Happy Birthday from them, but, but, guess what, they invited me a lovely surprise dinner and I ended up with trying to hide my happy tears behind a big smile. That night was touching. We visited a lot of beautiful and interesting places, met the most friendly people, and shared a great great fun to remember. It was planned as an "extreme sewing" tour in the beginning, but there was nothing about sewing at all in the end. We were too happy and too busy to pretend the geeks who sew their buttons in the sea just for taking a scheduled picture to name it extreme or something. Maybe next time. My birthday card was so pretty. Sewed and decorated with machine stitching. 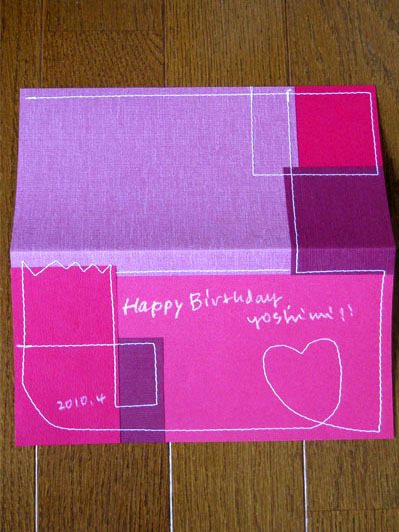 Chigu's work is always lovely and special like this. I had lovely words in it, from our friends who weren't there, too. 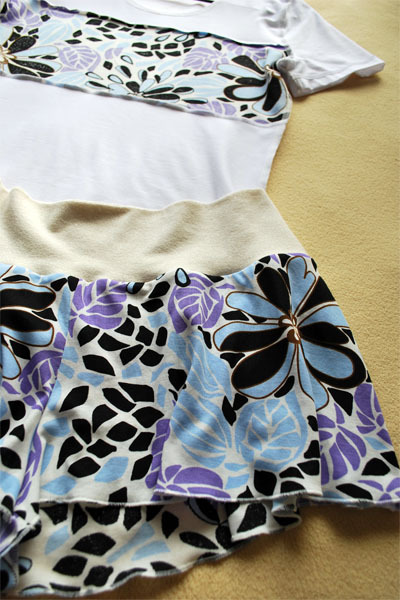 3 types of tucked skirt with broad yoke, I used viewC, one has a bubbled hem. 36-46, I downsized 36 to 34. Yes, I love the step by step instructions with well explaining pictures! I think skirts with bubbled hem are pretty, it can be also strange at the same time though. I knew it fit at my low waist if I made it in size 36, but I wanted to raise the waistline a bit higher this time. So I made it one size smaller to fit at my natural waist. I downsized the pattern using 36 to make it 34, my regular size for skirts is 36 though. I am not sure if I will sew it again very soon, as I have two of the balloon skirts now. But I am happy to recommend it if you are looking for a pattern for balloon skirts. I think this is a very well made pattern. 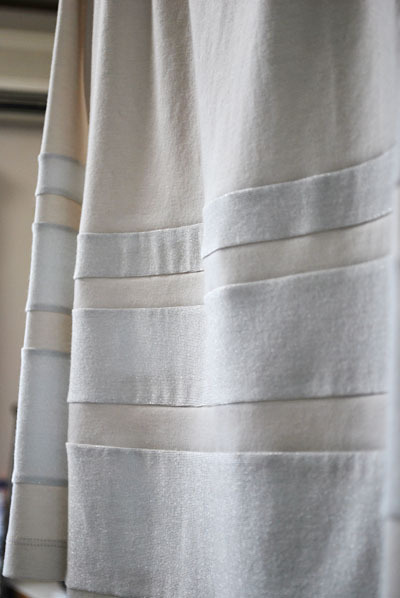 I definitely recommend fabrics that seem almost too thin and too hanging, if you'd prefer the one with subtle prettiness to the ones that clearly demonstrate their specialness. This is my second balloon skirt, and I think it looks OK. The first one was made of silk georgette and was less voluminous than this is. To be completely honest, I prefer the first one because of its subtler pouffe at the hem. 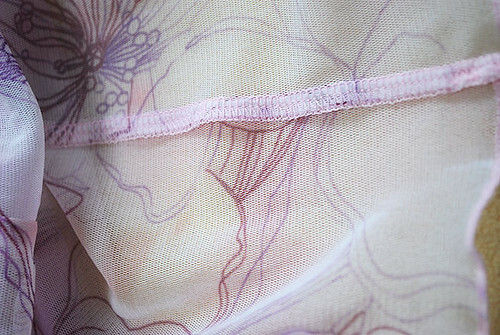 This silk chiffon was very very soft and fragile as fluid, but I got some volume as you can see in the picture. Said that I think it is quite pretty as it is and best for springtime! I sewed Lydia again, making it a short sleeved. I put a flowery contrasting fabric on the front body, and as you can see I sewed a pair of culottes in the same print jersey too. The pattern I used for these culottes was JJ's Knit Culottes from BurdaStyle, I cut the pants short as well as made them slightly flared to give a skirt-y look. Though it was the first time for me to use this pattern and I've never sewn a full length pair yet, the pattern is already one of my favorites. Thank you JJ, for this pretty and useful pattern!! Regarding Lydia, I forgot to take some "before" pictures, but the material I used for this Lydia was one XL sized white plain T shirt which was thrifted long time ago. I literally ripped it to the pieces and used them. 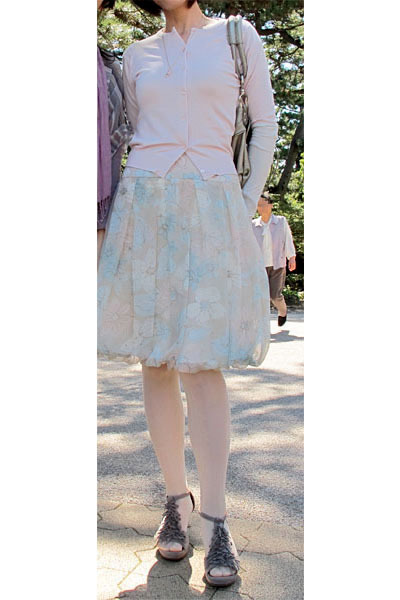 I think refashioning went so well this time, and am especially happy with how I put the contrasting flowery fabric. 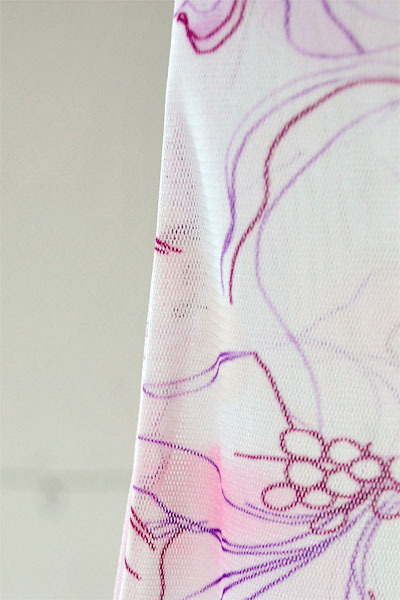 My contrasting fabric is meant to be functioning as a cover of the certain area, since the white fabric is very soft and is rather revealing the traces of underwear when it clings too much. Busy patterns are always useful for disguising the truth and what to hide. Cool. I bound the fabrics using my serger before cutting, in the way I did for making stripes on this T shirt. Oh, did I forget to mention that the tortoise(me) hasn't stopped jogging yet? I really love staying in front of my sewing machine, but recently I have also realized that I need some exercise in regular basis and I'd be better to give up some of my sewing time for exercising a bit. Hopefully I'll be healthier and slightly toned after some time. Actually, just thinking positive about it is already working very well on me, I feel myself very active and well-controlled, which is cool. Well.... don't laugh. I know you know I am a stubborn indoor sewing nerd. But at least I can give it a try. I added a hood using a pattern called Lydia hoodie variation, and attached a skirt without a pattern. 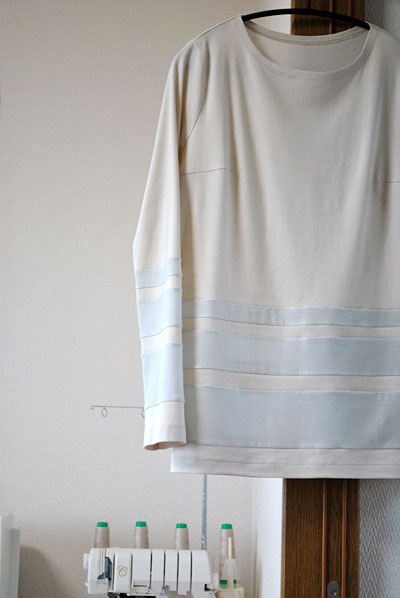 The border between the body and the skirt has two of thin shirring elastic bands inserted by machine sewing. I cut the sleeves in half, but I'd put a pair of hand(arm) warmers until the weather gets too warm. I sewed them using the pattern Yoshimi Handwarmer from BurdaStyle as you may guess. I sewed a pair of black leggings using Carol pattern from BurdaStyle, too. This outfit is totally BurdaStyle style, actually! Spring is good. I feel I'm alive. Yes, you're totally right, it is funny. Of course this skirt should have been posted on April Fool day! 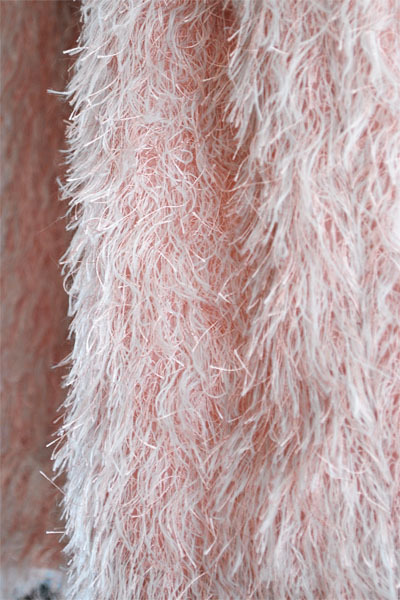 I bought this feathery synthetic apparel fabric in January, thinking I could make a warm cropped jacket for the late winter. However, soon after it reached me I found the fabric that I purchased via internet seemed definitely not right for the colder weather. It didn't feel warm at all, despite its sultry looking. I gave up thinking a wintry jacket, and it has been sitting in my stash since then. I've never had a single day without thinking it, though (a bit of lie here). 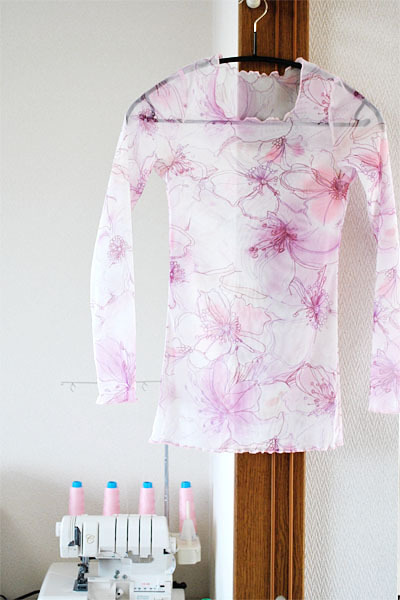 The body of the fabric is see-through thin nylon organza, which you may not be able to check from the picture, and it has got three colors (pink, light gray, and ecru) of probably polyester threads all over for decoration. The threads are not covering the fabric densely at all, but they're rather poorly planted on the right side of the fabric, which gives it a light and feathery look. 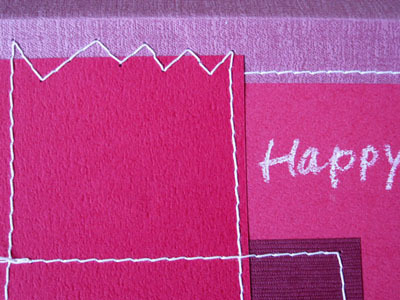 And I have to say, I am utterly fond of this funky non-versatile hairy fabric, as you probably already sensed it. I like it because it's strange and also pretty at the same time. Maybe I think it's pretty because it's strange...I don't know... This is a bit unique, indeed. BTW I'm always very grateful to you for being very patient and fantastically cooperative to read my queer writing in English. I'm especially devastated in putting prepositions and articles, because I barely sense the context in them. I suppose it's a cultural thing (background difference) involved, but it is very difficult to sense that I'm actually having the problem when I am writing in English. I know I have something I'd love to tell most of the time. But I am also certain that's not enough. Need more language skills! For now, thankyou, thank-you and thank you very much for being very kind. I, of course, have noticed this skirt is not a perfect office wear. Actually it's a nowhere wear! I just wanted to entertain you with my favorite fabric in my way. I think you'd agree with me if I said I was going to make a Charlie bag from BurdaStyle using this fabric. 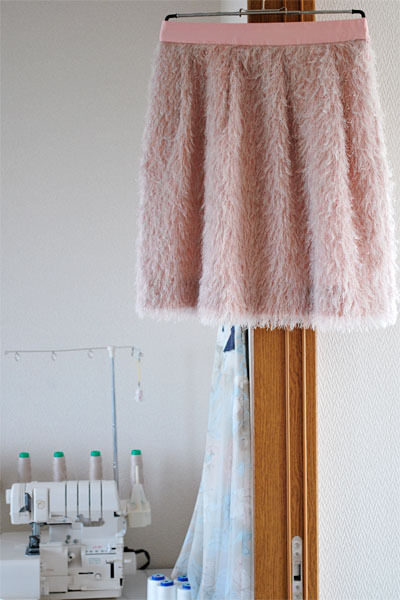 Then I could experiment with the leftover to make an unusual emu-y mini skirt. I think I'm going to sew a Charlie with the leftover later, the order is the other way round though! This is another experimental project, and I love the result! I've been always intimidated by plaids and stripes ever since I found that neat plaids and narrow constant stripes in colors of deep contrast, which were very popular and lovely on many people, were quite difficult because they were too crisp and too cute on me. I've looked for horizontal-striped things with irregular pitch in vague and subtle combination of colors, either in T shirt or jersey fabric, for very long time, but I was never successful in the search. So, I explain what I did. I made the material for my own striped T.
I chose two jerseys in subtly different colors and textures from my stash, and combined them into one piece of fabric with my serger. As you see, now I have my version of T with stripes of my liking. I must say I really, really love it!! The pearly ecru fabric I used for the body is very common cotton jersey with slight polyester blended. 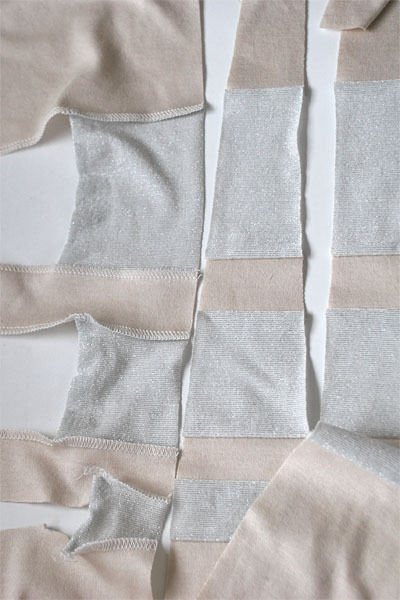 The fabric for stripes is pale blue-gray 2way cotton/polyester jersey which is thin, soft, glittery and very stretchy, like the materials for leggings. I used pattern 706, which is a pattern for a common boat neck T, from anneecotton*. The body was lengthened quite a lot as well as the sleeves, but nothing has been changed other than that. It was just a casual experiment, but I am so happy with how it turned out. I'd repeat this experiment when I feel like another striped T!! 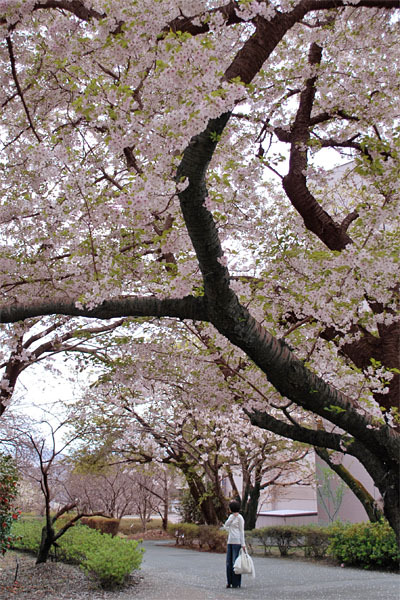 My favorite trees are in blossom, now. Thank you for your great feedback on my sheer Kylie! I've had some enquiries here as well as via e-mails, it kinda surprised me and also made me happy to know that some of you'd love to try yours in similar fabrics. I took some photographs to upload here for those who are interested in its construction (I mean seams and executions), they are.. errrr not so cute or artistic, though. Actually it's been literally stormy for a day in my area, thus I couldn't find a good sunshine for taking pictures. I know you are wonderful to extract the essences from what you actually see in the pictures in blogs, so please let me rely on your eyes (again)! I don't think polyester power nets are necessarily difficult to handle. It's much easier to sew power nets than to touch silk chiffons, I'm quite sure. They don't fray. They are not slippery. Cutting and sewing them are easy. Be careful not to stretch the seams when you bind them with your serger, we will be always rescued by the frantic ironing on messy stretched seams, though. It may be difficult to serge its hem in single layer without stretching, I guess. By the way, I have lived with my serger for 4 years, and I'd describe myself as an advanced beginner or something similar in serger sewing. I strongly prefer slim Ts to relaxed & roomy style of Ts in this kind of fabric, on me. I actually think power nets would be working OK with the patterns for very normal type of Ts, but I wouldn't choose them for myself because I'm not thin around my chest. I only know what would work well on me, so let you rely on and believe in your instinct for the better result with power nets. I'm sure you'll look fantastic in yours, because you are the person who knows and thinks of you most. to my Kylie was, binding all pieces with serger as you see in the pictures. I've done nothing complicated. I didn't bother to look for threads for knits either, but the 4 threads serger binding with ordinary span threads was perfectly fine for my purpose. Hems were all done by baby narrow roll with serger (help! I don't know how you call it in English, but I suppose you understand what I say) before binding all pieces. Currently I'm in love with my serger! I am working on my stretch fabrics and jerseys, and it's been so much fun zipping them up with my babylock to get new pretty clothes. I know it's nothing spectacular in sewing-wise, but you can't live without your Ts, I'm sure you'd agree with me about it. I made two of long sleeved T shirts. The first is a very close fitted one in sheer fabric. 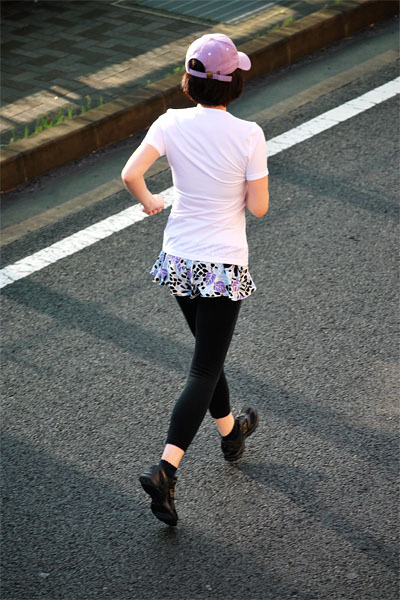 The polyester fabric I used is called "power-net". Power-net is elastic fabric, which has a net structure and is made in synthetic fiber (usually polyester) as far as I know. I used a pattern Kylie from TAMANEGI-KOBO, as it is very close fitted and I thought it would work very well with this fabric. I like the result and wish you can see why. Since this T shirt is very sheer and rather colorless, it's like wearing a pretty veil when you see it in real. I think it's whiter and more solid in the pictures. I'm bit sad because I couldn't bring a justice for it... Please be very imaginative, and you might see something good, perhaps. Well, I'm going to take some pictures of my second T, which is quite ordinary style with a special pretreatment, in a few days. I need another warm and sunny day!